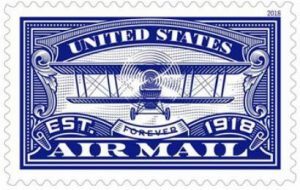 WASHINGTON — The United States Postal Service will honor the beginning of airmail service by dedicating two United States Air Mail Forever stamps this year. The first, depicted here in blue, commemorates the pioneering spirit of the brave pilots who first flew the mail in the early years of aviation. The first-day-of-issue ceremony will take place May 1, 2018 at 11 a.m. at the Smithsonian National Postal Museum, 2 Massachusetts Ave. N.E., Washington, DC. The event is free and open to the public. Followers of the U.S. Postal Service’s Facebook page can view the ceremony live at facebook.com/USPS. News about the stamps can be shared with the hashtags #AirMailStamps and #USAirMail. On May 15, 1918, in the midst of World War I, a small group of Army pilots delivered mail along a route that linked Washington, Philadelphia, and New York—initiating the world’s first regularly scheduled airmail service. The United States Post Office Department, the predecessor to the U.S. Postal Service, took charge of the U.S. Air Mail Service later that summer, operating it from Aug. 12, 1918, through Sept. 1, 1927. Airmail delivery, daily except on Sundays, became part of the fabric of the American economy and spurred growth of the nation’s aviation industry. The second stamp, red and pictured left, will commemorate this milestone with its first-day-of-issue to take place later this summer. Both stamps, printed in the intaglio print method— a design transferred to paper from an engraved plate — depict the type of plane typically used in the early days of airmail, a Curtiss JN-4H biplane. 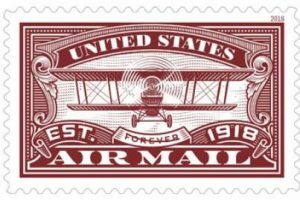 The biplane was also featured on the stamps originally issued in 1918 to commemorate the beginning of regularly scheduled airmail service. The stamp designs evoke that earlier period. For airmail service to succeed in the early days of flight, the Post Office had to develop profitable routes, such as between New York and Chicago, and to establish the infrastructure for safely making night flights. It set up lighted airfields and erected hundreds of airmail guide beacons between New York and San Francisco so that by 1924 regularly scheduled, transcontinental flying was possible, day and night. Airmail delivery, daily except on Sundays, became part of the fabric of the American economy and spurred the growth of the nation’s aviation industry. 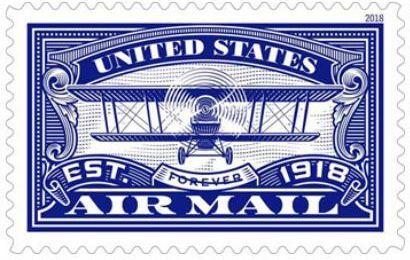 The United States Air Mail stamp is being issued as a Forever stamp. This Forever stamp will always be equal in value to the current First Class Mail one ounce price. 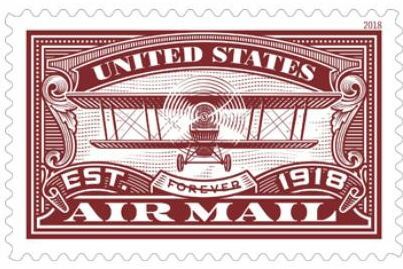 On the 100th anniversary of the beginning of regular airmail service, this stamp celebrates the courage of the pioneering airmail carriers and the foresight of those who fostered the new service and made it a success. The stamp, printed in intaglio, features a drawing of the type of plane typically used in the early days of airmail, a Curtiss JN4H biplane. This type of biplane was also featured on the 24 cent stamp that was issued in 1918 to commemorate the beginning of regularly scheduled airmail service. The words “UNITED STATES” and “AIR MAIL” are respectively at the top and bottom of the stamp. “EST” is an abbreviation for “established.” The stamp designer and typographer was Dan Gretta; Greg Breeding was the art director. The public is encouraged to submit stamp suggestions. Visit the Citizens’ Stamp Advisory Committeewebsite for details on the stamp selection process and instructions for submitting suggestions in writing. Due to the time required for research and approval, ideas for stamp subjects should be received at least three years prior to the proposed release. Each submission should include pertinent historical information and important dates associated with the subject. Very interesting as the last “real” US Airmail stamp was issued in 2012, the Lancaster County “Scenic America” finale, which was the last to show a small airplane indicating its primary use. (Scott catalogue C150.) There was a reprint of the 24c Jenny (C3) in 2013, but that was more to commemorate the inverted airmail error. And the Global Forever issues are sort of a continuation of the service, though not exactly. So it’s fun to see the phrase “air mail” come back, though really since the 1960s the distinction between air and surface handling has become increasingly moot.